BAH! I dont like the endings>:(. They should have all ended on the romantic parts and leave out the cafe trash talk. After playing through all the endings and choices, you get an okay idea of getting their relatively quick... -.-"
I can't wait for the 30th 6th episode!!!!! Thank you very much OvOb !! The 6th episode is coming tomorrow !! Can't wait ! Is there anyway to romance the teacher? I'm stuck in Episode 4, since if I trigger the conversation with Candice I keep getting 'death132'. Which kills me in Episode 5. Yes, there's a romance scene with the teacher in Cafe Rouge 5. And I believe "death132" is the only pw that activate the romance scene with the teacher. I think you meant that you die in episode 5 due to the "person following you rite?" for now, you have to reach home by going " Right, down, right, down, left ,down"
...so I die only because I get lost? I tought I was dying because nobody saved me XD Thank you! So you can't get demian? :( Then I no longer want to play this game. He was the only one I liked. Besides Chris. I've got the pw redblood37 in episode 5, but when i follow your instructions, i will still get child736 in the end of episode 6. why? Oh yeah u're rite!! XD I totally didn't notice I typed it wrongly!! Thanks!! How many people can be romanced in this game? Is Damien a possible love interest? I'll pretty much take anyone except Val tbh, even Aldo the chef!Don't like Val but the game keeps suffocating me with him. There's 3 guys if I'm not wrong, your teacher,Antoine & Val. Hmmm which episode are you at now? How does this walkthrough work????? I listed it in a way tat I state the password I used, then the password you are suppose to get, followed by the choices to get the password. Awww tat sux. You're welcome anyway. Hahhaaa I guess a book is kinda hard for them since they're still studying. But hopefully, they will continue down this path. Well, Ms. Michels did say something about pills keeping Isis in check... Or am I misremebering/overinterpreting? I can't bake the muffin correctly ._. I always get full bar and it says fail... help please? Hmmmm how can it be? It should be ok when its full bar, did u wait for awhile for the other button to appear? Hmmm how is tat possible.....which episode is it? Hmmm I have no problem with it. Hmmm maybe you missed out something? Make sure tat all the bars are filled with pink. i think the muffins were not baked at the right temperature. does the oven switch go green? Thanks for your lovely article for this. hehe. Now, I want to get the other two which is antoine and ronn. I love this game, anyone got any suggestions for any games like it? (that dont need to be downloaded). Is there any good endings with Val? or no? Will there be Cafe rouge 8? Omgsh, thank you so much! I was really confused as to why I was still not getting the "immortal007" password, even though I followed the guide. even though antoine has a good ending, the HEROINE die??? I can't stand it.. no matter how many time i try to get both of them alive, they always keep dying...UGHH!!! Hmmmmm I wonder why......did u head back to the kitchen after going to the bar? I also tried not heading back to the kitchen but always end up like "Everything went black" "THE END"! and then heroine die... i sick of it. Did you get both heroine and antoine alive at the end? How did you do that? Finally.. i got the good ending ^_________^ ... Thanks a lot..well.. there is still a mystery that Isis always gets dizzy whenever she sees blood and "That woman"... I wonder when they are going to continue for those unknown mystery..
Is there any chapter 8 or is it THE END??? It's actually solved if you go through's Ron's route. "That woman" is Val's mom, and she's one of the bluebloods. It's implied that she cloned Isis from Izzy in Antoine's route. In Val's route, it seems that she wanted Val and Isis to end up together. Also, in Ron's path, you also find out from Val's mom that Isis is a vampire that can turn humans into vampires, just like Izzy. She's been taking pills her entire life that Val's mom thought she couldn't be a proper vampire anymore. In Antoine's path, you also find out that Isis' eyes used to be a hazel color, which is closer to red, when she was younger. In Val's path, you find out that Val has the pills that Izzy takes for her condition, which only the school nurse and her doctor are supposed to have. This implies that Val's mom has influence over her medical providers and provides them with the pills. In short: Isis is a clone of Izzy, who has been taking pills from Val's powerful, blueblood politician mom that make her more human. But I'm still curious.. Why was Aldo acting suspicious before the murder if he had nothing to do with it? He tried to hide his pig ^^. I knew from the beginning that Chris would be the murderer because he was missing to prepare the "attack". Wow just passed the whole game!!! So awesome, i fell in love with this sim! The person has to make a manga, an anime or something!! Its was so good. Come visit my DevientArt sometimes! I got Chris's ending !!! How do you do Valen's path? I'm barley on episode 2. I didn't understand something although I tried all the passwords. So .. in each episode I found more and more information about Isis and the other persons, but the end was a realy mistery. Who are the bad guys? The blue/ red blood? If Isis stay with Valen, his mother don't enslaved her ( but she still want to turn all the people in vampires). And if she remain whit Ron.. well I think in this case Isis is the most protected. What do you think? Who was lying, and who was telling the truth? .... OMG! The directions for the Cafe are soooo hard to find! and the cooking took me 3 tries each cuz it was really hard for meh. WHY CHRIS WHY?!?!? i actually liked him ;( but i like Valen better :D Let's just say... I LUV THIS GAME! I love this game!! Only tried 2 endings so far--Valen's and Antoine's good end. Valen's was pretty cute but Antoine's was WAAAAAAH PERFECT <3 In love with Demian's flashback~ though the confession near the ending was a bit 'off' thanks to the 'I-still-love-Izzy-anyway' thingy. Awkward. But still, amazing. Ahhhh I want romance with the Manager. But im stuck on Ch.3 what answers do I pick!? o.o plz help!! This game is very fun. One of the best I have played online for free so far. The art style changes often like with CGs, normal interaction and during times when the characters get to move. The story is very compelling and I love that mostly every choice available can truly change the story altogether ^_^ I have to reply it many times to see all possible scenarios. It's worth playing. I used misfortune00 for episode 5 and it left me without a code and the screen said "The End". Did I die or something? This is pretty weird but I have a crush on Antoine. I wish Isis hadn't flinched when Antoine reached for her. I would've comforted him. Will there be a cafe rouge 8? 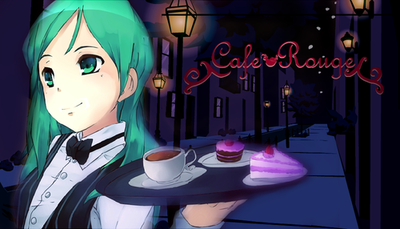 When I played the last cafe rouge antoine's route,I cried that was intensely sweet. O my god!!! That is really Awesome!! I was about to go nuts if I didn't find what she might have been and what was her connection to Izzy. I truly thank you for making my head not burst with confusion and anger at the game otherwise I would have partly hated the game but, now I love it 100%!! THANK YOU!!! I think that is so true. I have been thinking about that for so long now. And because in real life you really can clone a living object from a DNA sample. Hide at the bar and don't peak just wait. Im pretty sure if you could say yes to chris, he would probaly take you somewhere and then he would kill you since he was planning to anyway. did you make sure all the bars are full....? They are online :) you don't need to download them. Just a little detail, they are short, but she has done many of them so you can have fun anyways. how can i get demian??? On episode 4 I keep failing at making the truffles yet I'm getting everything done, why? Round 1 - You have to drag the Reddish brown truffles. Round 2 - Drag the Truffles into the water. Wait for all of them to float. Drag to tray. Round 4 - Keep pressing on the truffles till the bar stops increasing. Repeat for all. On episode 6 I keep failing on cooking. It's just that none of ingredients stay in the bowl. Why? I try all of them bat it seems like none is first in order. What I do wrong? You have to put the ingredients into the bowl in order, ingredient at the top, then right, bottom right, left, bottom left. am I the only person who cant pass the cooking stuff? There are many facts or things left unclear during valen's path. Like the when isis's parents give up and say that she is special. The game doesn't explain why the redbloods were after isis since her birth, how valen got the medical pills, why valen drank blood from isis. I cant understand all these things! I like valen the most but his path is the most confusing. Can someone help me please? Is this considered as online multiplayer games? I just want to know if everyone can use this. just found the game and it's fun but can't find anything in it.